It’s a project in Johnston that some Cranston residents aren’t happy about. Several wind turbines now tower over an area near the landfill and a section of homes in Western Cranston, including Alpine Estates. “I see five unobstructed, 519-foot turbines from any window along the back of my home and from every part of my entire backyard,” one resident said Monday night during a City Council meeting at City Hall. Several others also shared their concerns. “I came home one day and half of them were up in 24 hours,” said resident Kerri Carreiro. The wind farm, built by North Kingstown-based Green Development, is located in an industrial area off Plainfield Pike and Shun Pike in Johnston. Green Development also owns wind turbines in Coventry, North Kingstown and Portsmouth. Once fully operational, the Johnston site will be the largest wind farm on land in the state. 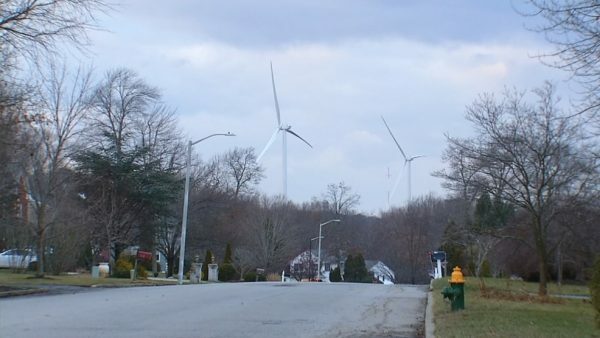 Many of the roughly 500-foot German-built turbines are now in plain view of many Cranston homes. At the meeting, a Cranston administrator said the city was never officially notified about the project. But a lawyer for the City argued that it is a Johnston issue and believes it’s next to impossible to win in court if legal action is taken. City Council President Michael Farina said he wants to draft a resolution asking the attorney general’s office to review the steps taken in Johnston. NBC 10 reached out to Johnston Mayor Joseph Polisena and a Green Development spokesperson for comment but requests were never returned.